Take your family to one of England’s most spectacular castle ruins in Warwickshire, and discover links to some major historical figures – including ‘Bad’ King John, Henry V, and Henry VIII. However, Kenilworth is most famously associated with Robert Dudley and Queen Elizabeth I. Elizabeth kept Dudley’s last letter to her in a casket by her bed until she died. View a copy of this letter, and explore Leicester’s gatehouse where Dudley courted his Queen – both part of a multi-million pound investment. This includes two exhibitions, a brand new audio tour that brings Kenilworth’s eventful past to life and the recreation of the original Elizabethan garden. Apart from the great historical interest attaching to these magnificent ruins, they deserve, architecturally, the closest examination and study, containing, as they do, elaborate specimens of the best constructions, in both military and domestic branches, during the different periods of the art in this country. We find first the massive square Norman keep, which had its protecting moat. This was the work of the original grantee Geoffrey de Clinton, the treasurer and chamberlain of Henry I. Next comes an era, from 1180 to 1187, when we find entries for building and repairs to walls and fortifications; and again, from 1212 to 1216, the castle being then in the hands of King John, vast sums were expended upon the outer line of walls, with their flanking defences of Lunn’s Tower and the Water Tower, and upon a chamber and other accommodation for the King, most of which still remains, though the timber constructions inside and against the walls have, of course, not survived. 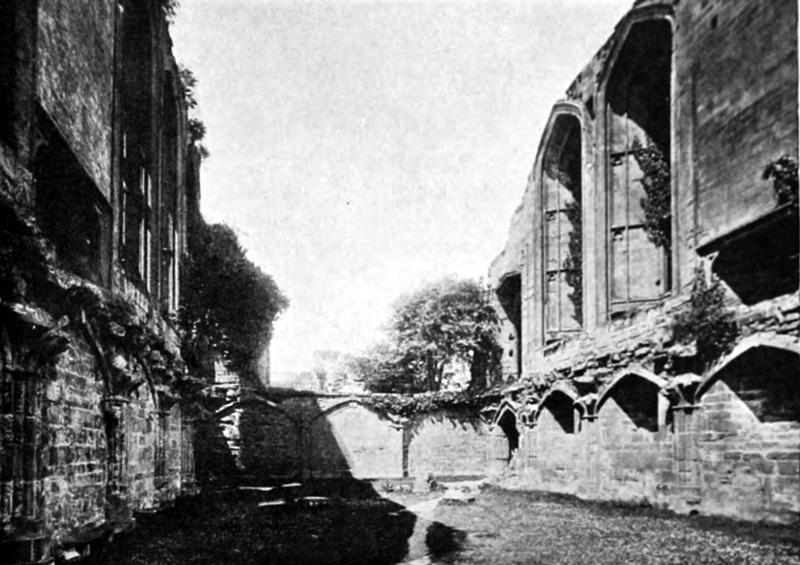 The next development is in the Late Decorated or Perpendicular style, including the ruins of the great Hall and some other buildings at the West end of the inner court, still called Lancaster’s Buildings, of the fourteenth century, rather late in the reign of Edward III., being some of the additions made by John Of Gaunt, after he obtained Kenilworth by his first wife. After this portion come the various alterations and insertions of the Elizabethan period, the beautiful gatehouse on the north side, and the towers and works added by Robert Dudley, Earl of Leicester, and called the Leicester Buildings. Here are, therefore, examples of four different periods, in each of which the particular work is capable of proof by existing documents, showing the gradations and changes which these buildings underwent, according to the requirements of the different ages, in passing from the barbarism of a military despotism to the comforts and splendour of later civilisation. It is a magnificent specimen, and one easy of access. As we have said, the manor of Kenilworth was bestowed by Henry I. upon Geoffrey de Clinton, who founded here a castle and a monastery; deriving, doubtless, from a Norman follower of Duke William, he must have been of worth and eminence among the barons, since, besides the Royal posts which he occupied, the King appointed him to the Chief Justiceship of England. He was succeeded by his son, Geoffrey, married to Agnes, daughter of Roger, Earl of Warwick, whose son, Henry, parted with Kenilworth, most probably on compulsion, to King John, who made it a Royal residence. One of the rebellious sons of Henry II. had taken possession of it, and held it for a time. Henry III., on his sister, the Princess Eleanor, marrying Simon de Montfort, Earl of Leicester, settled Kenilworth on her for her life, but in 1254 it was granted for the joint lives of the Earl and Countess of Leicester, and they made their home here. 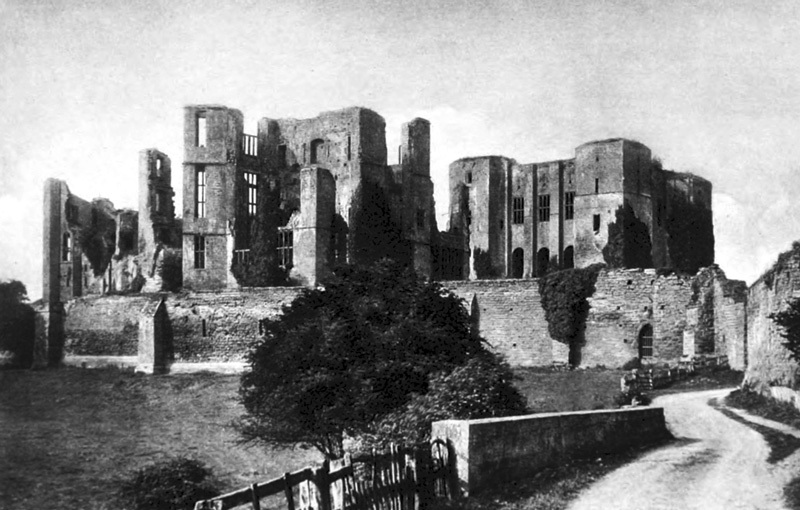 During the Barons’ War which followed, this castle was made the base of operations by de Montfort, who provided it with warlike engines of defence not then known in England, and stores of all sorts, and after the battle of Lewis, Richard, King of the Romans, Henry’s brother, with his youngest son, Edmund, was sent prisoner to Kenilworth, under the care of Leicester’s second son, Simon. In 1265, after effecting his escape from the custody of the barons at Hereford, Prince Edward, by a daring night attack, beat up the quarters of young de Montfort at Kenilworth, and took temporary possession of the place, making prisoners thirteen knights bannerets, with their followers, who were unguardedly sleeping in houses around the castle perhaps for the sake of an early bath. Young de Montfort and his pages narrowly escaped capture, and only did so by a headlong race, “some stark naked, some in breeches or drawers, some in shirts, and many with their clothes under their arms”. Departing thence Prince Edward rapidly effected a junction with his friends in the west, and overwhelmed and slaughtered the Earl of Leicester at the battle of Evesham. After this the Royal forces returned to Kenilworth, which still held out manfully under the earl’s second son, Simon, and underwent a close siege that lasted for six months. Trenches were cut on the land side of the castle, and huge wooden towers, holding slingers and archers, were advanced against the wall, while barges, transported overland from Chester, maintained the attack across the castle lake; but the garrison, which numbered 1200 men, met these assaults with the mangonels and other engines of de Montfort, and only gave in when reduced by famine, when, with the surrender of Kenilworth, the Civil War came to an end in December 1265. Having thus recovered possession of the fortress, King Henry bestowed it and the manor upon his youngest son, Edmund, whom he created, two years later, Earl of Lancaster. 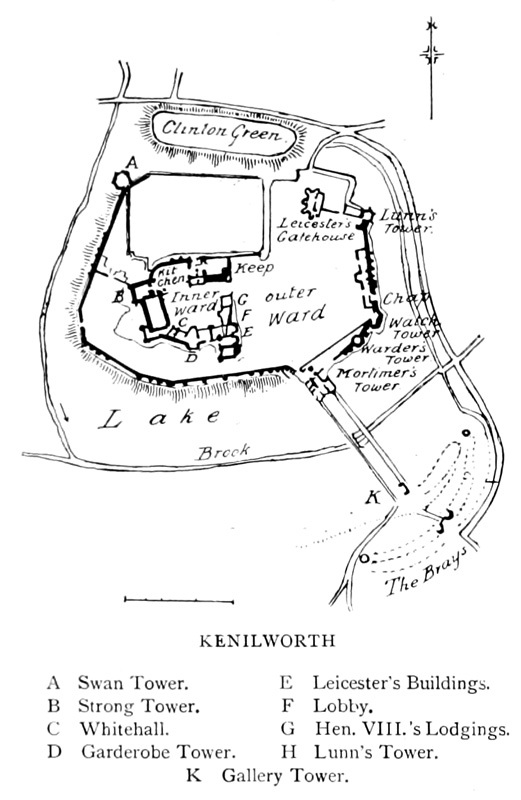 In 1279, under the encouragement of that martial prince, Edward I., a very magnificent tournament was held at Kenilworth, under Mortimer, Earl of March, for the space of three days, at which, besides the sports of tilting and the barriers, the new military game of the Round Table was introduced. King Edward II., after his flight and capture, was brought a prisoner here to meet the Commission appointed by Parliament, from whose lips he received the announcement of his deposition in favour of his son, at hearing which he fell senseless to the ground. Of the presence chamber, where this mournful scene was enacted, little remains but fragments of walls and two large bay windows festooned with ivy. The unfortunate King was shortly after, on December 5, removed hence to his hideous doom in Berkeley Castle on January 25. On the accession of Edward III. the castle again became the seat of baronial splendour under the Earls of Lancaster, the third of whom, Henry, was created Duke of Lancaster, but dying s.p. male (35 Edward III. ), his two daughters became heirs to his great estates : Blanche, the younger, inheriting Kenilworth, and bringing it, and afterwards, on her sister’s death, the whole property of her father, in marriage to John of Gaunt, fourth son of Edward III., who shortly after revived in him the title of Duke of Lancaster. The wealth thus obtained from his father enabled in great measure the duke’s son and heir, Henry of Bolingbroke, in later days to oust his cousin, Richard II., from the throne, and to take his place thereon as King Henry IV., being greatly driven thereto by the King’s treatment of him in regard to Kenilworth. The range called Lancaster Buildings was caused to be erected by John of Gaunt between his accession to the property and his death in 1399. They lie on the S. side of the inner quadrangle, and there is a tower with three storeys of arches adjoining the hall on the N., also of this date; the same origin is given to the Strong, or Mervin’s Tower, as it is called by Sir Walter Scott. The ancient garden of the castle was situated near the N.E. angle of the outer wall, where the Swan Tower meets the lake and the wet ditch on the N.
Of course on Henry IV. succeeding,the Crown resumed the ownership of the fortress, and thus it continued, often enlivened by the visits of royalty, until the days of Elizabeth, who bestowed it on her favourite, Robert Dudley, fifth son of the Duke of Northumberland, with all the royalties thereto belonging. Without enlarging on the history of this courtier, it is enough to say that he seems to have expended the enormous emoluments derived from the many dignities with which Elizabeth overwhelmed him in his lavish outlay upon Kenilworth. The additions and alterations made there by this Dudley involved an expenditure of £60,000—an incredible sum in those days. He erected the great gatehouse on the N., also the mass of square rooms from the N.E. angle of the upper court, the buildings called after him, and the gallery and lower gatehouse towers, together with a great range of stabling. He removed the Norman windows from the keep, replacing them by more modern ones; and it is evident that the great object of his outlay was to provide magnificent accommodation for the entertainment of his Queen and her Court. This reception took place in July 1575, and the festivities were continued for seventeen days, during which every sort of prodigal extravagance possible at that age was indulged in. It cost Leicester £1000 a day. At his death he bequeathed the castle to his brother Ambrose, Earl of Warwick, for life, and afterwards to his own son, Sir Robert Dudley, upon whose birth and legitimacy the father (who is certainly one of the dark characters in English history) chose to throw doubts. When the place fell into the hands of Oliver Cromwell, a sort of commission of army officers was sent to Kenilworth to divide and share the property between them, and they, caring nothing for historical associations, the splendour of the structure, or the richness of the furniture and plenishing (it was but seventy-five years after the entertainment of Elizabeth there), proceeded to strip the place, to cut the timber, kill the deer, and even to sell the walls and rooting for the value of the bare materials. At the Restoration, Charles II., granted the reversion of the manor to Lawrence, Lord Hyde, second son of Lord Chancellor Clarendon, whom he created Baron Kenilworth, and Earl of Rochester. His grandson leaving only a daughter, the lands and the ruins came by marriage to the Essex family, and afterwards, by marriage, to Thomas Villiers, the second son of the Earl of Jersey, created, in 1756 Baron Hyde, in whose family they still continue (1896). At Kenilworth was immured Eleanor Cobham, the wife of Humphrey, Duke of Gloucester, after the performance of her penance on the charge of practising witchcraft against Henry VI., and here she ended her days. As in most other cases the Norman baron founded his castle on the site of a Saxon home with a fortified burh; a square keep was built on the most commanding position, perhaps on the mound, and a large walled enclosure was made, defended on the W., S. and E. sides by a lake and by a deep ditch across the N. front. Somewhat on the W. side of this was formed the inner ward, a rectangular enclosure, nearly 1½ acres in area, the N.E. corner of which was occupied by Clinton’s keep. This is a plain Late Norman edifice, with a fore-building on the W. side, and containing a vaulted basement and one upper floor only, the former being entirely filled with earth. The main floor formed one immense room, 34 feet by 64, and about 40 feet high. The forebuilding contained the staircase of approach to the entrance doorway, and above was a room, possibly an oratory. Large corner turrets, three containing mural chambers and one a large spiral stair, cap the angles of the keep, the walls of which are of immense thickness. There is no evidence as to what was the nature of the Norman buildings in this ward, since they have been replaced by the work of the Earls of Lancaster, and of John of Gaunt, and are called by their name. W. from the keep are the ruined kitchens, showing a huge fireplace and baking ovens. At the N.W. angle is the Strong Tower, of three stages, which was perhaps used as a prison for persons of consequence. Adjoining this is the Hall, a pure Perpendicular building, due to John of Gaunt, beyond which was the white hall, and next the State rooms, which are connected with a large garderobe tower. Then at the S.E. corner comes the range to which the name of Leicester’s buildings has been given, and the E. face to the keep is made up by the site of Dudley’s Lobby and Henry VIII: s lodgings, but all this has perished. The outer ward is a large oblong enclosure, 270 yards long from E. to W. by 174; at its E. end were domestic offices, the entrances and the chapel. Originally this ward was divided by a ditch 70 feet wide, running N. and S., with a bridge for access to the inner ward, part of it remaining in front of Leicester’s buildings, and the rest having been filled in probably by Dudley after the visit of Elizabeth. (Clark.) This outer ward contains about 9 acres, having a circumference of 750 yards; it is formed by a strong curtain wall embracing six important buildings : namely, the octagon Swan Tower on the N.W, Mortimer’s ‘Tower, or the gatehouse, at the head of the dam across the lake, called either after Lord Mortimer of Wigmore (temp. Edward III. ), or from Sir John Mortimer, imprisoned here in the reign of Henry V. Then towards the E. came the Warder’s Tower, and next the Water Tower at the S.E. corner, a complete mural bastion of Early Decorated style; whence the curtain runs to Lunn’s Tower at the N.E. angle, a round building 36 feet in diameter and 40 high. At the back of this part of the wall is a long range of stabling and farm buildings, with an upper half-timbered storey, said to have been built by the great Earl Thomas of Lancaster, in the reign of Edward II., but some part is Late Perpendicular. Next to this is the chapel. W. of Lunn’s Tower is the building called Leicester’s Gatehouse, built in 1570, a rectangular tower with octangular corner turrets. On the N. side of the great ditch, which is cut through the rock and forms the N. defence, is Clinton’s Green, where are still banks of earth, probably survivals of the great siege by Henry III. In front of Mortimer’s Tower is the dam, 80 yards long, across the valley, having at its further end the remains of a flood-gate and outer gatehouse, or the gallery tower, with a drawbridge here over the outer ditch. This was the point at which Queen Elizabeth made her entry. Beyond it was called the Brayz, where tournaments were held, as they also were on the dam itself. On both sides of the dam extended a lake; half a mile long on the W., and some 12 feet deep, upon which the attack by ships was made by Henry III. Finally, beyond the Brayz was a great curved outwork forming a tete du pont in front of the entrance.